Crystal ceramic has trace elements which can improve the human metabolism and effectively promote blood circulation. Cotopaxi volcanic magmatic - Thousands years of geological movement gives it striking ability, and enable it to have greater functions of relieving convulsion, soothing the nerves, calming the liver, improving ears and eyes, and relieving asthma than ordinary magnets. FIR Energy Stone - Can release more pure Far infrared ray, Scarlar Energy and negative ions. Effectively improves the "Krebs Cycle",Thus improves Energy, Endurance and Strength .It also can help peploe effectively resist the electromagnetic wave from computer ,phone or electrical appliance. 1.Save all kind of private information to this Smart Ring. 2.Set screen lock and APP lock randomly and let ring become the only key to your privacy. 3.Quick start multi-function scene mode. 4.Can share IMAGE and TEXT card information, is compatible with Android and WP mobile phones. 5.User can edit URL links and import to Smart ring, or by explorer sharing function. 6. User can set Smart ring as the key to door according to the matching process of intelligent door lock. 7. User can set Smart ring as the way to unlock the screen of mobile phone. 8. Can add 6 images and 2000 characters to a piece of NFC codeword. enables " delete after reading "function, is compatible with all Android and WP mobile phones. 9.User can click the sharing function of network disk, select and write in the Smart ring, and then touch the mobile phone of others. 【UIQUE HEALTH MATERIAL】- Made of Epoxy crystal ceramic, blended with Volcanic Magnet and FIR Energy Stone, contributing a lot to wearer's health. Crystal ceramic has trace elements which can improve the human metabolism and effectively promote blood circulation; FIR Energy Stone can help peploe effectively resist the electromagnetic wave from computer, phone or electrical appliance. Volcanic Magnet can improve human performance effectively. 【MULTI-FUNCTION】- 1.Save all kind of private information to this Smart Ring. 2.Set screen lock and APP lock random. 3.Quick start multi-function scene mode. 4. Can share IMAGE and TEXT card information. 5.User can edit URL links and import to Smart ring, or by explorer sharing function. 6. User can set Smart ring as the key to door according to the matching process of intelligent door lock. 7. 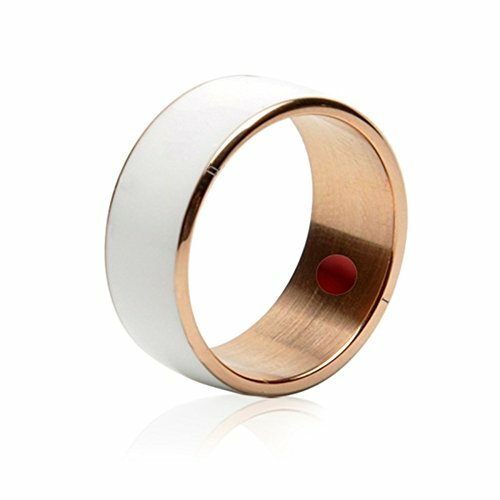 User can set Smart ring as the way to unlock the screen of mobile phone, 8. Whisper. 【WIDELY COMPATIBILITY】- Support phone models such as Nokia, Sony, Samsung, HTC, MIUI and all other NFC-enabled Android and Windows Phone systems. PLEASE NOTE: This item only can work for the Android and Windows Phone which support NFC function, Please confirm your device if your phone support NFC before purchasing. And This smart ring not support IOS. Thank you. 【STANDARD US SIZE】- Full U.S. sizes optinal, size 7: inner perimeter:54mm, size 8: inner perimeter:57mm, size9: inner perimeter:60mm, size10: inner perimeter:62.8mm, size11: inner perimeter:66mm, size12: inner perimeter:70mm. (Please refer to the size picture). 【WATERPROOF DUST-PROOF AND FALL-PROOF】- IP68 waterproof level, dustproof and excellent resistance to fall and rolling resistance can be competent to the application requirements of any occasion. No need battery charging, make you forget the recharging and wiring harness, and use it at any time. High Speed NFC Dual-core Chips, it brings top speed operation experience to the following mobile NFC features.